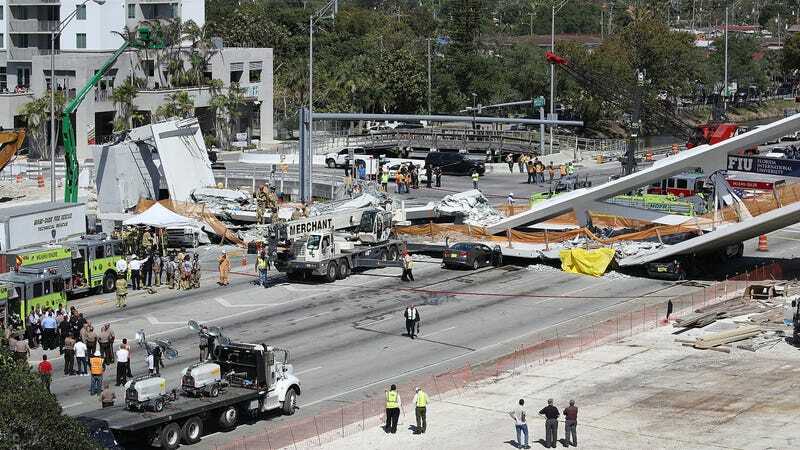 The main span of a pedestrian bridge at Florida International University constructed as recently as Saturday has collapsed, reportedly leaving “several” people dead and crushing cars underneath. The span had been rapidly installed in less than a day, following months of planning, according to a story in the Miami Herald. The bridge was expected to open in 2019. “Before Saturday’s installation, FIU said the method of overall installation significantly reduced the risk to workers, walkers, drivers and minimized traffic disruptions for construction,” the Herald reported. It wasn’t immediately clear what caused the span to collapse. At a press conference, officials confirmed that eight vehicles were trapped under the bridge and eight victims had been transported to a nearby hospital. Some construction workers were on the bridge at the time the span fell apart, officials said. ABC said that a “stress test” had possibly been underway before the collapse, but officials declined to comment on the reports. “We will conduct a full investigation to determine exactly what went wrong and will cooperate with investigators on scene in every way,” MCM said. The university said in a brief statement that it was “shocked and saddened about the tragic events” that were unfolding at the scene. The university highlighted the span in a video last week, calling it the “first-of-its-kind” and saying it was “about building bridge and student safety.” The 174-foot span weighed 950 tons and was built using so-called Accelerated Bridge Construction Methods that were designed by the university’s Accelerated Bridge Construction University Transportation Center. The $14.2 million project was designed as a cable-supported bridge by Munilla and Figg Bridge Design. Just last week, TSA worker Jose Perez accused Munilla in a lawsuit of failing to properly construct and maintain a makeshift bridge at Fort Lauderdale International Airport. In the suit, dated March 5, Perez said he was walking to the bathroom when the bridge gave out. Figg was hired to design the replacement for a bridge on I35 in Minnesota that collapsed in 2007 and killed 13 people. The company issued a statement saying it was “stunned” by the collapse and that it would cooperate with investigators. This post is being updated as we get more. What&apos;s The Worst Bridge In America?